In an effort to stay ahead of an expanding market and increasing demand to produce and manage materials as quickly, efficiently and affordably as possible, many companies outsource manufacturing operations. Research conducted by the Peerless Research Group in collaboration with the Supply Chain Management Review and E2open revealed that there are many benefits to outsourcing, including increased cost-savings, improved processing and better logistics partnerships between businesses. Traditionally, using this strategy to enhance supply chain management has made a lot of sense for many corporations which is likely why, according to the source, 84 percent of companies currently do. 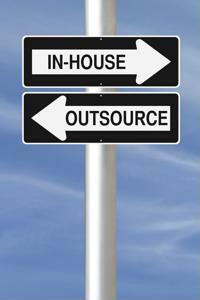 By outsourcing manufacturing, an organization is able to free up time to focus on other essential areas of business. However, since the industry has seemingly been in a transition period during the past few years, largely attributed to the Internet of Things becoming increasingly popular, it's important for managers to assess their current strategies to ensure they are taking the most effective possible approach. To determine whether or not outsourcing manufacturing is and will continue to be a viable solution for supply chain management, the PRG surveyed almost 100 experienced industry professionals and discovered that the answer, put simply, was a resounding yes: Outsourcing is a smart, long-term and sustainable approach for companies to take. The research found that the majority, or about 79 percent, of respondents plan to either continue with their current outsourcing operations or will increase them over the next couple of years. The source also noted, however, that the biggest driving force incentivizing a business to outsource depends on the company's size. For example, smaller organizations benefit from increased expertise whereas medium-sized companies are motivated by a rise in profit margins. The survey also found that outsourcing works best when there is supply chain visibility - though the PRG is far from the first to suggest the importance of operational transparency. Increased visibility provides supply chains with opportunities for cost-reductions, better inventory management and control and a reduced risk of disruption. However, as Dave Lubowe, an IBM executive, pointed out to Forbes contributor Robert Reiss, it is one of the biggest problems areas managers are challenged with today. "The key issues facing virtually all operational leaders are visibility across the supply chain, optimization to increase capability and decrease cost, and demand variability that is increasingly difficult to predict with only historical shipment data and current orders," Lubowe explained. "We need to collect data relevant to those issues and find ways to better manage the end to end supply chain, both within and outside the enterprise." And while the need for better visibility and transparency is clear, the solution for getting there is not as easy to identify. Perhaps this is why, the PRG research indicated, the majority of companies are lagging in this department, with top 52 percent of respondents saying their visibility with top tier partners is not on a high level. To correct this issue, the report authors suggested that converting to an integrative system that that provides a company access to real-time information. Doing so will allow them to "leverage the collective brainpower of their trading partner communities to manage end-to-end supply chain processes and to respond intelligently to continuous change in supply, demand, products and partners." Though many organizations have and will continue to implement outsourcing manufacturing strategies to improve their bottom lines, research has indicated that some degree of adjustments and updates may be needed to maximize the potential for success. Fortunately, thanks to the digital revolution, industries have more options available to them for affordable and efficient solutions than ever before.